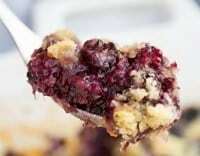 This easy blackberry cobbler recipe is an old fashioned favorite from my grandmother. It’s incredibly easy to make and is bursting with flavor. Fresh blackberries really make this classic shine but frozen or canned blackberries work as well. It’s a great quick dessert for those busy evenings or last-minute guests dropping in. This recipe has that delicious southern, old-fashioned cobbler flavor but what makes it easy is it’s a blackberry cobbler with cake mix. Make sure you try the blueberry cobbler version of this recipe. Or our fantastic peach cobbler. I don’t always have the luxury of fresh blackberries in my refrigerator (or totally carefree days! ), but canned blackberries from the pantry make a fine substitution. 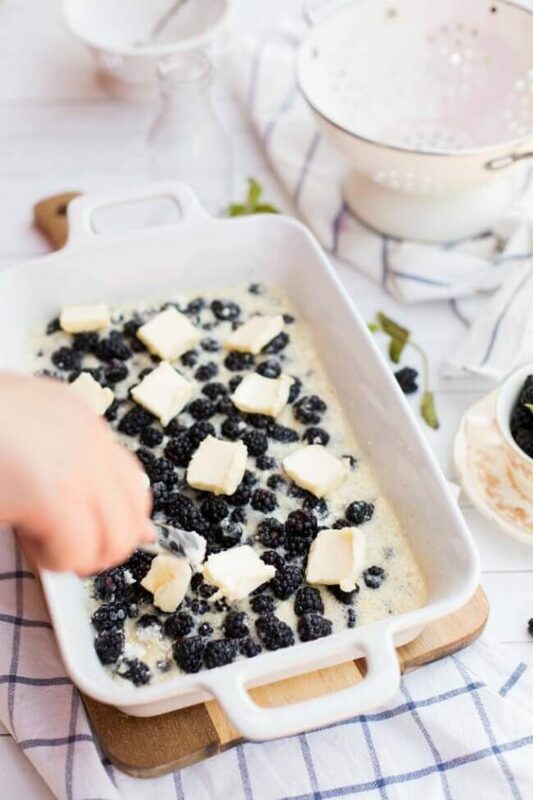 To make Mim’s Blackberry Cobbler, pull out a 9 x 13-inch baking dish and pour in a full box of a yellow cake mix. Don’t add water or eggs. Just the dry cake mix. Spread blackberries evenly over the cake mix. For sure you’ve tasted a berry or two by now. Depending on how sweet they are, sprinkle one or two tablespoons of sugar over the berries. Evenly pour one cup of water over everything. Jiggle the baking dish a little so the water kind of soaks in and settles to the bottom of the dish. If the berries aren’t very juicy, you’ll want to add a little more water. And if you’re using canned berries, reserve the water they’re packed in and use a cup of it instead of the plain water. Unless you don’t want the crust to be purple. Dot the top of the cobbler with a stick of butter cut into eight pieces. Slide it into a 350-degree oven for 35-40 minutes and get ready for a taste of joyful summer afternoons. A scoop of ice cream on top is optional, but hey—we’re making memories here! How do you make cobbler crust? The crust for this recipe is so simple! Just pour the box of yellow cake mix into the casserole dish and it becomes the crust. You can use regular pie crust strips if you don’t have a yellow cake mix. It does change the taste and texture, but it is still delicious. 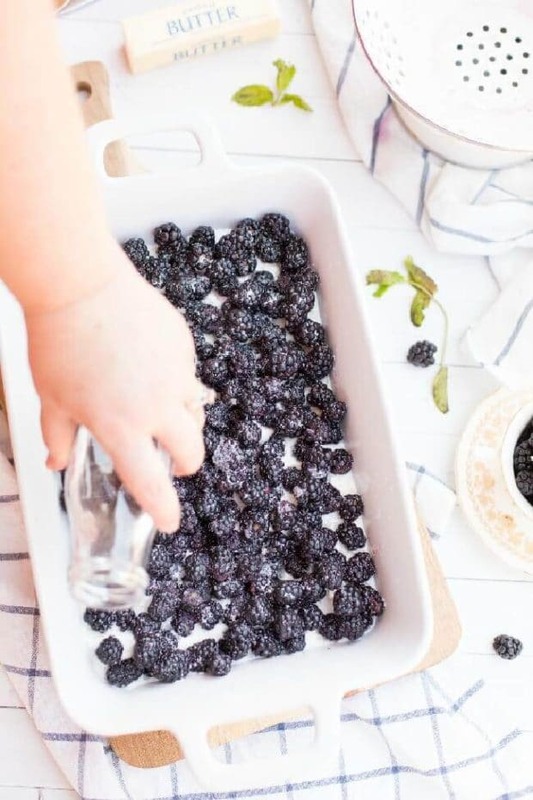 How do you clean fresh blackberries? Cleaning fresh blackberries is easy. Much easier than cleaning some other fresh fruits. Pour the berries into a colander. Discard any errant leaves or stems. Set the colander in the sink and run water over the berries. Leave it there to drain while you begin the recipe. This dessert will also make you remember carefree summer days when finding juicy berries felt like discovering buried treasure. There’s nothing like a bite of warm Blackberry Cobbler, fresh from the oven, to right the wrongs of the world. Banana Pudding <- A Reader Favorite! 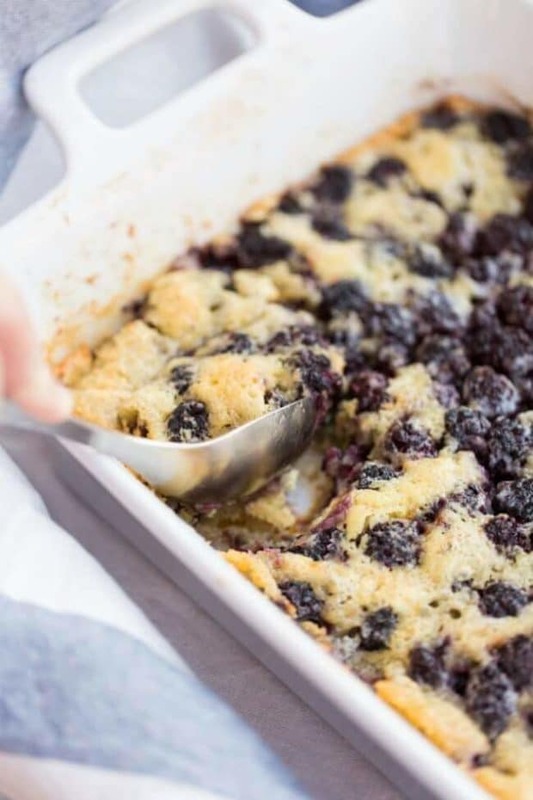 This simple blackberry cobbler recipe came from my grandmother -- and it's oh-so-good! In the bottom of a 9×13 baking dish, pour one box of yellow cake mix. Spread blackberries over the top of the cake mix. Sprinkle on 1-2 tablespoons of sugar (depending upon how sweet they are). Pour 1 cup of water over top of the berries and cake mix; shake pan so water settles into the bottom. If berries aren’t very juicy, add a little more water. If they are plump, a little less. Cut a stick of butter into 8 pieces and spread out over the top. Note: The amount of sugar and water needed in this recipe can vary, depending on the berries. Before you start, taste the berries for juicy sweetness. Adjust sugar and water accordingly. Also, it is important to pour the water over the top and shake the pan. You want the berries and water to really settle into the pan! 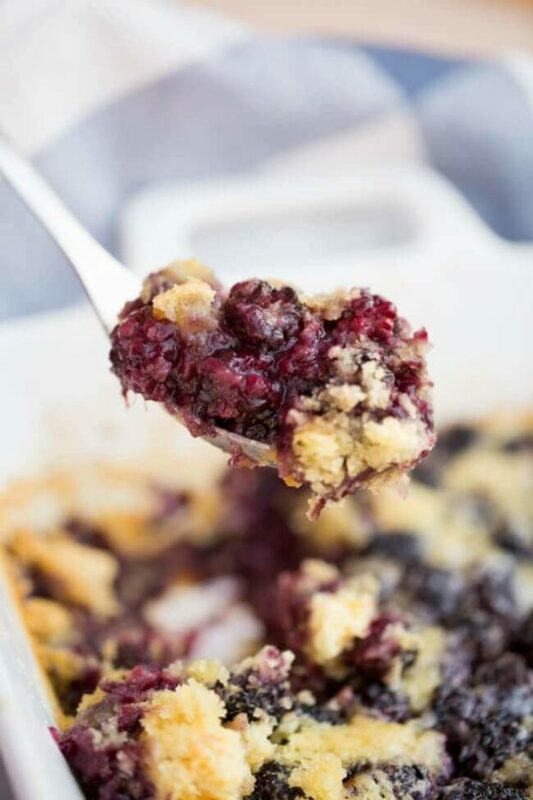 This blackberry cobbler is a dessert that I am going to make time and time again. I pretty much wanted to eat the whole thing by myself! This dessert is definitely AMAZING! Hi. Can you tell me how many grams are in a ‘stick’ of butter, please? I’m in Australia and we use grams here. Thanks. 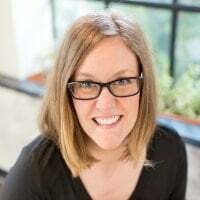 Hi, Julene – thanks for stopping by. This is what Google is telling me 🙂 One tablespoon of butter converted to gram equals to 14.18 g. How many grams of butter are in 1 tablespoon? The answer is: The change of 1 tbsp ( tablespoon ) unit in a butter measure equals = into 14.18 g ( gram ) as per the equivalent measure and for the same butter type. 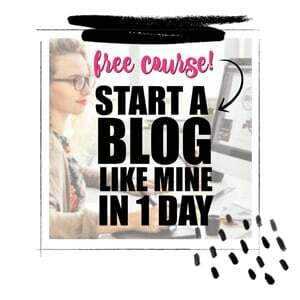 I hope that helps… enjoy! Sorry – one more thing… a stick of butter is 8 tablespoons! So a total stick of butter in grams would be 113.44 in grams it looks like. I have made a recipe very similar to this but used a large can or 2 regular sized cans of peaches instead of the blackberries but everything else in the recipe stays the same as with the blackberry cobbler. You mentioned we could use pie crust strips.How would you use the pie crust strips if you did not have the cake mix. On the bottom or the top. You could make a separate pie crust and cut strips to top the cobbler if you wanted. How come my cake mix didn’t cook all the way. It remained dry and uncooked at the bottom. The liquid never reached the cake mix??? I shook the water around but it didn’t sink into the cake. I baked it but the cake was still powdery. Can you stir the water into the cake mix? No, you don’t stir it. You’d want to continue to shake until the water did go into the bottom and was more soaked up or it will turn out dry. Good luck!